Charlie Palmer opened his Dry Creek Kitchen restaurant in the Hotel Healdsburg on the town’s historic plaza in 2001. A number of executive chefs succeeded him over the years with varying degrees of success, but when Scott Romano, veteran of the Palmer and Puck organizations, assumed the role in 2016, he re-established Dry Creek as a destination for foodies. We visited the restaurant on the day after Romano had worked the Pigs & Pinot festival, an annual weekend of food and wine sponsored by the Hotel, with the participation of local eateries and dozens of Pinot Noir producers. The dining room has an open plan, with a bar at the front – empty this night, although the tables were full. The design is light and airy, with a vaulted ceiling, a wall of windows looking out onto the plaza, architectural floral arrangements – on this visit, a riot of cherry blossom –and a semi-open kitchen partially exposed through its stripe-etched glass partition. Service is friendly and knowledgeable, dress is casual, and the noise level is human, with an indistinguishable contemporary jazz soundtrack in the background. The restaurant’s wine list is dominated by Sonoma wines, and there are always a few rarities available by the glass. Wine prices are not cheap, but consider this: the restaurant allows diners to bring in up to two local bottles without a corkage fee—this even though they claim to offer the largest selection of Sonoma County wines in the world. And every Monday, 50 Sonoma wines are offered at half-price. On our visit, we were tempted by a five-course tasting menu ($79), also available with wine pairings ($48), but ultimately we opted to try three starters and two mains, which we paired with a number of selections from a page of 15 or so wines by the glass, the list augmented by the sommelier’s offering of pours from bottles that had been featured during the Pigs & Pinot festivities. The starters were terrific. We asked for the salad and octopus appetizers to be served together. The bright greens – purple kale, slivers of Brussels sprouts, and chicory – were bulked with whole grain farro, garnished with dried glazed chips of Meyer lemon, and dressed with a fennel- and lemon-accented vinaigrette. The very dry, savory 2015 Carlisle The Derivative, a blend based mostly of Sémillon and Muscadelle, made a good match for the salad, with its aromas of fig, lemon, grapefruit and white flowers leading to a surprisingly glyceral but very fresh palate and a mineral-tinged finish that complemented the salad’s citrus elements. It also paired well with the crisp filigree of greens and bracing acidity of the dressing that accompanied an outstanding dish of Spanish octopus: finger-thick yet tender tentacles that had been brushed with tamarind glaze, grilled to a slight char, garnished with slices of salumi, set on a soft bed of caramelized spaghetti squash and skirted with dots of port wine molé. Of course, halfway through this dish we were on to Pinot Noir. 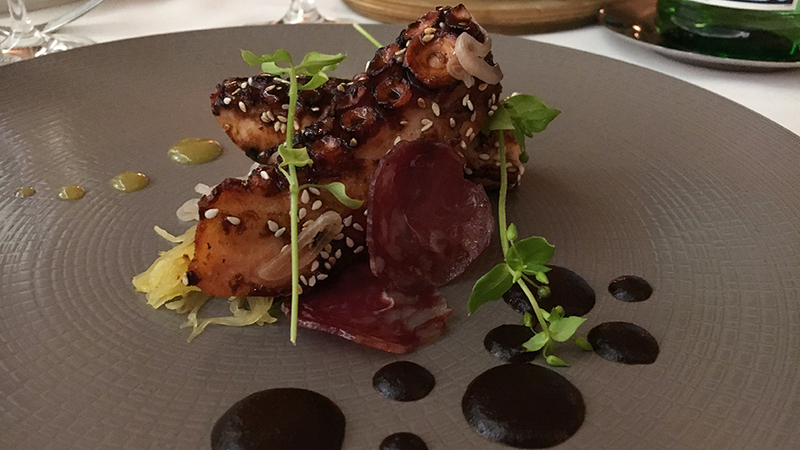 The 2014 Maybach Irmgard Pinot Noir, made by Thomas Brown, offered brisk aromas of cranberry, plum, blackberry, black tea and soft brown spices, with a silky texture, savory herbal, soil and coffee tones, and velvety tannins that foregrounded the squid’s balance of sweet and salty elements. Let me state right here that Romano’s risotto alone is worth a pilgrimage. What most of us look for in a risotto is that mystical ratio of texture to flavor intensity, the impression of discrete al dente grains that have been bound together (not gummed!) with just the right amount (neither dry nor soupy!) of a thick umami-tinged liquefying agent. 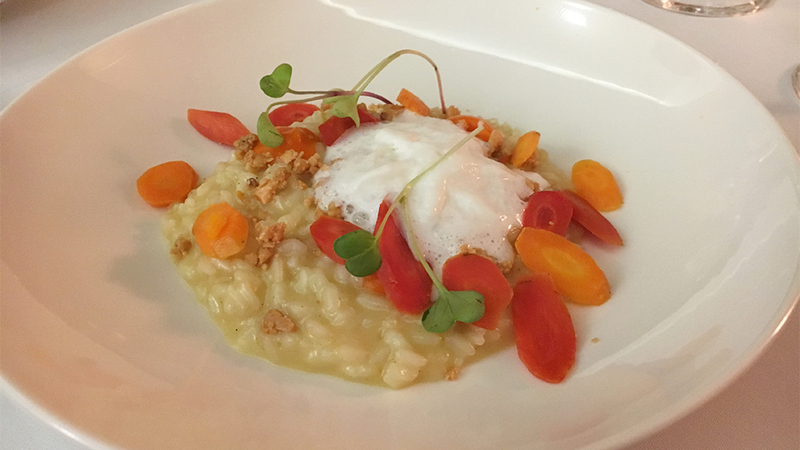 At Dry Creek the risotto derives its distinctive flavor profile from a gutsy marriage of assertive ingredients, starting with a liquid base intensified by parmesan rinds, so that this note emerges forcefully without the added weight of grated parmesan. Vadouvan gives smoky-spice curry complexity without becoming cloying. Additional sweetness and salty crunch come from roasted baby red and orange carrots dusted with Marcona almond crumble. Atop rests a foamy cloud of Laura Chanel goat cheese, a capper that improbably heightens rather than fights the other elements of the dish. The 2014 Martin’s Lane Pinot Noir from Okanagan Valley (in Canada’s province of British Columbia), made by a winemaker from New Zealand, was very ripe and sweet, with varietally expressive aromas of plum, strawberry and spices and a plush, savory palate impression—perhaps a bit lacking in refinement but surprisingly persistent. And it did not overwhelm the rich risotto. 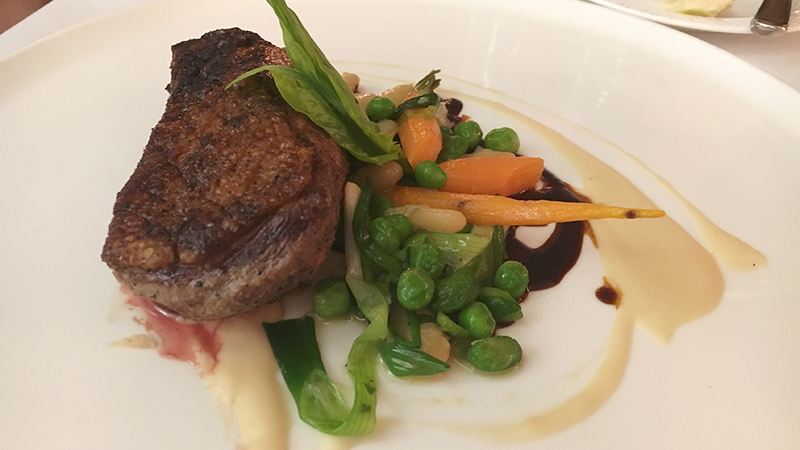 Our entrées again showcased local ingredients with the same commitment to bold, clean flavors. 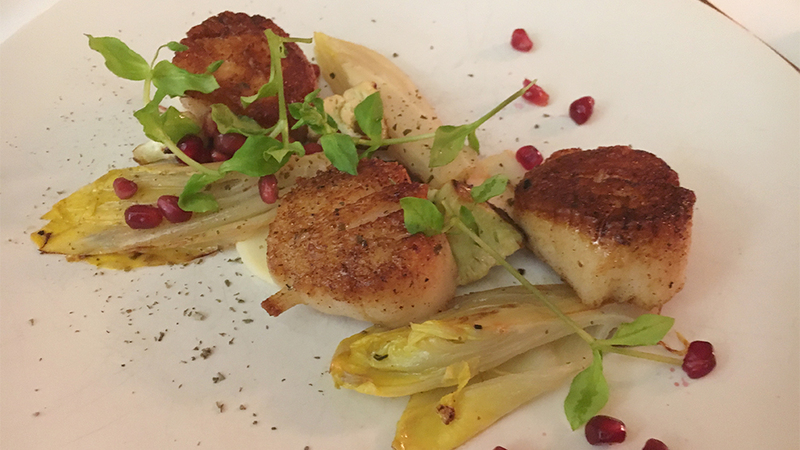 Pan-seared diver scallops were plumped on a swoosh of cranberry-raisin purée, offset by the slight bitter edge of braised endive and enlivened with a pop of pomegranate seeds. As for the “cassoulet” we ordered: don’t be surprised when your server asks how you want your duck cooked—the house’s take on the dish has nothing to do with wintry confit and sausage, but rather turns out to be whole duck breast served alongside a spring mélange of firm fava beans, English peas, and tiny carrots with a smudge of cannellini purée. Liberty Farms duck is slightly wilder than East Coast farm versions tend to be, with a texture that is more venison- than steak-like. The kitchen here lets the flavorful meat and veg speak for themselves, with unfussy presentation and a minimum of jus. Needless to say, the duck was perfect with the 2015 Rochioli Three Corner Pinot Noir, whose penetrating blackberry, blueberry, mint, spice and floral aromas lead to a wonderfully juicy, intense palate featuring a mineral element, a distinct light touch and a long, rising, suavely tannic finish. 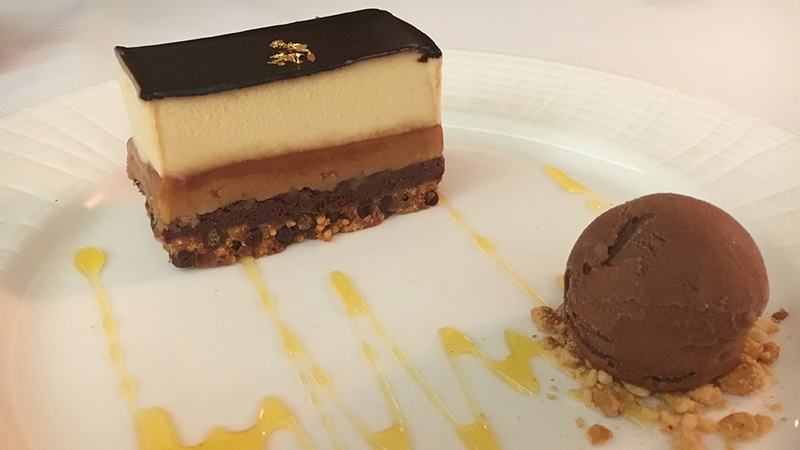 The chocolate peanut butter bar, a staple of all of Palmer’s kitchens, was a no-brainer choice for dessert: rich layers of praline crunch, peanut butter mousse, white chocolate mousse, dark chocolate ganache, candied peanuts and vanilla bean-citrus caramel, accompanied by a scoop of dark chocolate sorbet, the ensemble forming a platonic statement of how sugar only becomes whole when coupled with salt.